I have got the left front finished, it took me a bit longer to knit this than it did the back as I had not been as motivated last week. 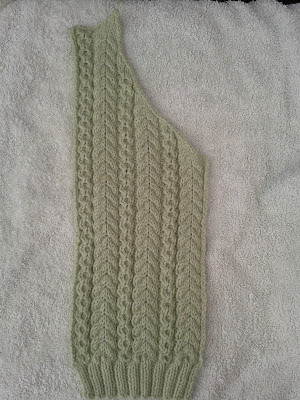 I left it a week with just the rib and 8 rows of the pattern complete then yesterday and the day before I knitted like mad and got it finished so here it is. In other news, I have bought another Bond (I do really love the Bond Machines!) It is an Incredible Sweater Machine and I go and pick it up today, from Blackpool, about an hour from me so is not too far, so that is something to look forward too. I also finally found some ribber clamps for my Knitmaster 155 chunky ribber. I was browsing eBay as I normally do and saw a listing that read "Knitmaster Knitting Machine Chunky SR155 Ribber Clamps" I did not believe what I was seeing. The clamps were on for buy it now £20 and I did not wait a second longer to buy them. I have been searching for these clamps for nearly a year now, so I can finally use my chucky ribber, set up correctly, I can now get ribbing!!! I have never used a bond, I have heard its like the marmite thing, either you love it or you don't....I would love to have a go on one though to see what they are like. Yh the Bond is like the marmite thing, I do love mine, though others have issures, you just have to get use to it, as it is slightly different to other machines. I have yet to make anything on the Knitsmart I bought which is basically the same as a Bond. It is very different as you say. Guess I am still so enchanted with my 700's. The front looks great, can't wait to see it all finished. My "New" BOND Incredible Sweater Machine!